To promote gender enabling environment in the society at large. To sensitize public sector Departments to bring in Gender Equity in their respective programs. To promote women participation in policies as well as in public services. To protect working women both in the public and private sectors. To promote monitoring mechanism on the gender disparity in the province. To promote career guidance to female students. To build capacity of Judicial & Police Officers on Gender-related court cases. To build capacity of locally elected female representatives on Gender mainstreaming and gender-based budgeting. To promote gender equity in the province. Social Welfare Officers of all 25 districts were trained on Gender Mainstreaming, role of women in Socioeconomic Development, Project Cycle/ PC-1 preparation. 61 numbers of Officers of provincial line departments were trained on Gender-Based Planning & Monitoring. 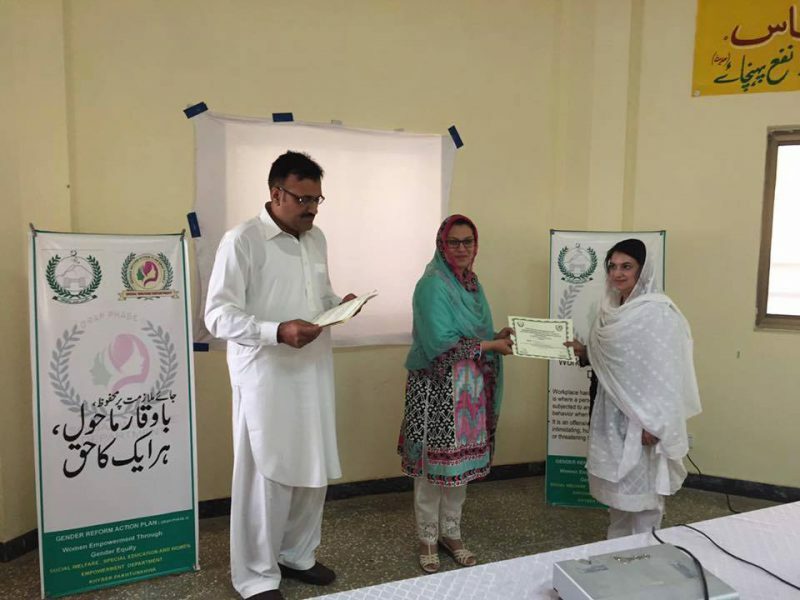 720 numbers of Female students of degree level were provided career counseling in different fields pertaining to their studies at Districts of Charsadda, Mardan & Peshawar. 240 numbers of officers of District line Departments of Abbottabad, Kohat, D.I.Khan, Mardan Peshawar & Swat got awareness on harassment issues and steps for stopping harassment at the workplace under 2010 Act. 50 numbers of Civil Judges working in various Districts of the Province were imparted training on Gender Mainstreaming and Women Empowerment. 2 �days Training was arranged for Provincial Line Departments on Goal-5 of SDGs with special reference to equity in resource allocation. A survey is under progress on Industrial sectors of Hattar, Haripur and Peshawar with special focus on equity in wages and employment. Awareness material on display of Harassment act, 2010 was displayed in all Provincial departments.